Wow. I can’t even begin to tell you what kind of week I’ve had. Back to school is always a hectic time, but I didn’t anticipate this kind of hectic-ness. It has been totally crazy. For the last week, it seems that I have driven to the ends of the earth and back, and then did it again. When we moved houses this summer, I knew that I would now have to drop the kids to school since we were now a bit further down, but I didn’t realise that’s all I would be doing. It doesn’t help that my college age child doesn’t want to take the bus (her college is less than a mile down the same road we live on!!) but rather have me chauffeur her to classes and back, and guess what? She picked classes that are at random times during the day. Add to that, my son’s soccer practices on Mondays and Wednesday for an hour and half each day, the college child’s new job and my second daughter’s vibrant social life, I think you can see my dilemma and fatigue. Needless to say, I’ve had no time to cook dinner let alone be inspired to create for the blog. Actually, I have a lot of ideas, they just can’t be implemented and I am seriously going to have figure out something because cooking/baking and photographing take more than 20 minutes at a time to complete! So, today I am posting an old recipe that I actually, republish every year. I love this corn chowder so much that I like to make every year when the corn is abundant and I like to share it with my new readers. I update the photos every time I make it so the photos are new but the recipe is the old, trusty one that is a classic now. While the corn is sweet and crunchy, make this chowder! I know it’s hot still, but as fall temperatures set in and the cooler nights arrive but the last of the corn is still around, this is a perfect dish. It’s been hot I Denver the last few days but the evenings are cooling down nicely so this hit the spot last weekend. I did hit my farm stand last weekend and got some watermelon, cantaloupe and sweet corn. Soup is the last thing you think of when the sun is shining and it’s hot outside. Our minds are on sweet, fresh lemonade, vibrant green salads and smoky, charred meat from the grill. The idea of warm, nourishing soups and stews seems to weigh us down just thinking about it. However, summer is also the season of corn. When you have exhausted all the traditional ways of eating your summer corn; grilling, roasting, boiling and buttered, a creamy bowl of corn chowder is a great change. This recipe first appeared in The Rocky Mountain News paper in 1997 when we lived here back then. I remember making it with the season’s last bit of summer corn. It sounded so good to me that I remember making a special trip to purchase all the ingredients to make it for dinner that day. It was good back then and has been every time I’ve made it since then. I make it almost every summer when the corn is in abundance. The only change I made to the original recipe is adding garlic and using vegetable broth when I didn’t have chicken broth. The soup doesn’t need any spices or anything extra. The star is the fresh corn and its sweetness and the pleasant crunchy-ness. The cream (or use half and half) makes the soup rich and luscious so don’t leave it out. Corn and cream were made for each other! Add a nice, crusty loaf of bread and dinner is complete. When I make this soup, it is the main dish, I usually don’t make anything else along with it except for some bread and butter. The soup is rich and filling all by itself. A delicious chowder utilising the best of the summer corn; sweet and creamy. In a big soup pot melt the butter over medium heat. Add the thyme and garlic and cook a minute or so till fragrant. Add the potatoes, chicken broth, and the water. Heat to boiling until the potatoes are tender, about 10-15 minutes. While the potatoes are cooking, cut the corn kernels from the cobs. Scrape the cobs to release the milk using the back of a knife. Add corn kernels and the milk to the pot and cook 7 minutes. Stir in the light cream and heat through. Do not boil or the cream will break. Spoon into bowls and serve with crusty bread. I am a bit behind visiting everyone’s sites but I promise to get to you all this weekend. I am also behind keeping up with my own! Happy thoughts would be appreciated. Hope you all have an amazing Labour Day weekend. Any special plans? Just finished making this. Yummy. We have similar feelings about corn chowder, I just posted a recipe that I’ve been making for years, and now is really the best time for it, the corn is still so good! Glad to have found your blog! A busy mom who still manages to create such knock out meals? mom of the year,Nazneen!!! Fool of the year more like!! Hats off to you Nazneen! I feel tired and busy with just one kid and her various classes beside school. The corn chowder sounds so comforting and delish. Thanks for sharing the recipe. You welcome Taruna! One child or four, they take work don’t they? My God Nazneen, that sure sounds nightmarish. I get fatigued just trying to get the boys to their regular after school activities and occasional running-late-drop-to-school routine. Good luck with all that you have in your plate. And to think what we do all day….!!! I love the look of the chowder and the red bowls are gorgeous. It sounds like you truly have a busy schedule. I’m glad you had time to prepare and photograph the chowder…it looks delicious in your red bowls. 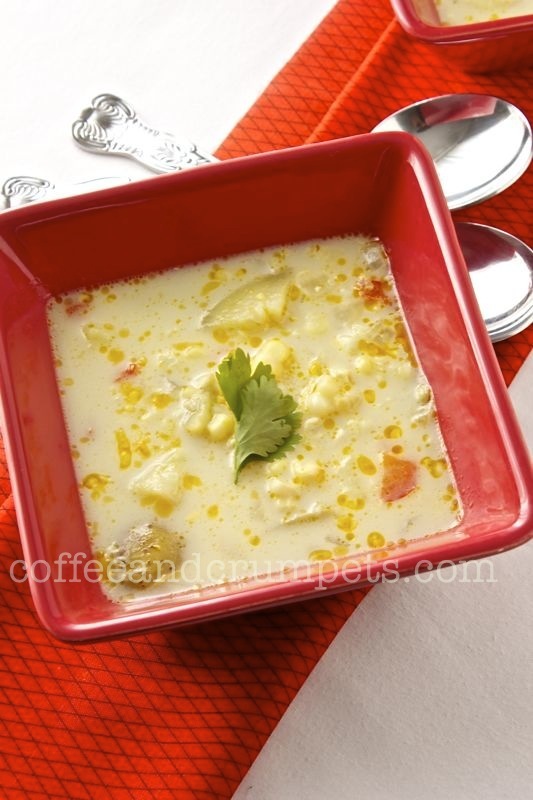 corn chowder sounds amazing, i shall bookmark and make this soon! thx! Great looking corn chowder. Still too warm here for that, but quite soon it’ll be perfect – and there will still be fresh corn available. And less than a mile to school? I’d walk! Weather permitting, we walk everywhere we can – including a nice 2 mile stroll to the supermarket (obviously we don’t buy anything we can’t carry). We walk more miles each year than we put on our car! Your corn chowder looks lovely, I’ve never tried making one ever.. but I absolutely love corn – so I’m missing a link here !! Gotto try this soon. What a superb meal. WoooooOW! When you and others talk about their life getting busy with kids, I wonder how am I so busy with just 1 kid? But yeah, I do get really busy with the kind of social life my husband has, sometimes I feel tired keeping up with everyone… almost every Saturday, even some Fridays or Sundays there is something going. I am still blogging but keep my blog visits to just a few. If you are reposting this soup every year, I bet this tastes just as wonderful as it looks. I can totally relate to the craziness when school begins-We can hope as everyone gets adjusted it eventually settles down. Love,love corn chowder and this looks delightful. Nazneen, I exactly know what you are talking about. I don’t know what we get ourselves into when we put them in classes, even if it’s one or 2. Summer is fun and school year is like a clock work and goes in fastforward…crazy but your chowder sure makes all the fatigue go away. Looks really nice. Shashi @ http://runninsrilankan.com recently posted..Peanut Butter-Addiction-Fueled August Foodie Pen Pal Adventure! It’s nice to know that I’m not the only one that’s finding it hard to find time for food and blogging! If only I had a backcatalogue of fabulous posts to share!! That soup looks gorgeous and I adore those red bowls! Thanks Jas! I don’t have many back ups!! This just happened to be one I wanted to post anyway so it kinda worked out! I love corn!!! The chowder looks summery yet comforting. I am such a fan of soups that I don’t mind if temperatures are hot and rising… Soup is something that it is versatile and seems right anytime. Denise Browning@From Brazil To You recently posted..Pamonha de Forno Goiana (Brazilian Tamale Casserole)…Comfort dishes are the best! My mum tells me going back to school is definitely most hectic for her as well so I can imagine your fatigue! Thanks Uru! Yes, it’s hectic but I am hoping it will slow down soon.